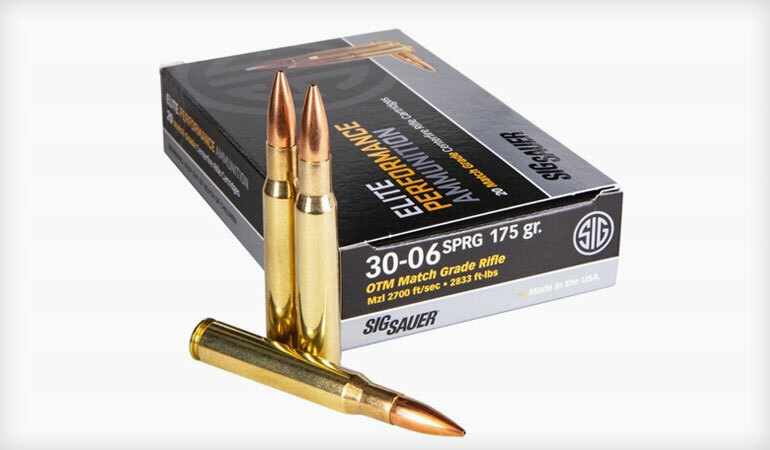 SIG SAUER, Inc. adds to its Elite Match ammo line with the 30-06 Springfield. Featuring a 175gr Sierra MatchKing bullet, the SIG SAUER 30-06 Win Open Tip Match (OTM) round has a muzzle velocity of 2,700 fps with a muzzle energy of 2,833 ft-lbs. “Our 30-06 Springfield Elite Match load is designed to excel in today’s modern firearms as well as older rifles such as the M1 Garand and delivers the accuracy and reliability shooters have come to expect from SIG SAUER Elite Ammunition. Given the resurgence in popularity of the M1 Garand and numerous vintage rifle matches being held across the country, there is significant demand for this cartridge.” -Brad Criner, Senior Director, Brand Management and Business Development, SIG SAUER Ammunition. SIG SAUER Elite Match ammunition features a temperature-stable propellant that delivers consistent muzzle velocity in all weather conditions. Premium-quality primers ensure minimum velocity variations, and the shell case metallurgy is optimized in the SIG Elite Match OTM cartridge to yield consistent bullet retention round to round. All SIG SAUER rifle ammunition is precision loaded on state-of-the-art equipment that is 100% electromechanically monitored to ensure geometric conformity and charge weight consistency. The SIG SAUER 30-06 Springfield Elite Match ammunition is now available for purchase at the sigsauer.com/store.